Texas Housewife: You Want Me to Do What? Happy Monday y'all! Today I bring you an interview with author Lynn Goodwin. 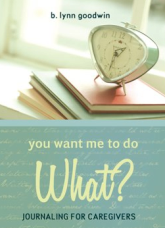 Lynn is the author of You Want Me to Do What? Journaling for Caregivers. I found this to be a wonderful book for caregivers. Be it caring for a child, a parent, a spouse, whatever your situation, journaling can really help. You Want Me to Do What? Journaling for Caregivers offers encouragement, instructions, and over 200 sentence starts to help anyone start putting their thoughts on paper. Those who have tried it, love it, and Sharon Bray, the author of When Words Heal: Writing Your Way Through Cancer has said, "As someone steeped in the therapeutic value of writing during pain and loss, I think B. Lynn Goodwin's book meets a need that has yet to be addressed." What made you start journaling? In college I recorded events and thoughts, because I thought it might matter some day. I went back to it when my mother gave me a red, bound notebook. At first, I would copy quotes from the books I was reading for author interviews. Soon I began reflecting on how they related to my life. A year later I read Julia Cameron's The Artist's Way and began doing daily morning pages, writing three pages of longhand about anything. It cleared my mind and made way for creative thought to bubble up. My journal was a tangible, central clearing house for my brain. What did you learn about yourself through journaling? I learned to dig beneath my emotions and find the reasons that my negativity came up. I learned how full my life was and is by making gratitude lists. I learned that there is always more to say, and sometimes the idea that has been eluding articulation will rise to the surface in the next sentence. I learned to process events and discoveries rather than letting them slip away. I learned to write freely, without judgments. They have their place, but it is not in my journal. How can keeping a journal help caregivers? A journal is a safe, private place to vent, process, analyze, evaluate and rediscover love and hope. Use it to explore hopes and fears. Use it to find the dreams and love that can fade away when caregiving takes up every hour of the day. Use it to record your experience and your stress. University studies have shown that writing reduces stress and improves health. Writing saves lives. Do not underestimate its power. Do you have any suggestions for those who are new to keeping a journal? Write every day if you can, even if you only jot down two or three sentences. If you have no time, start with "If I had time, I would have written..."
Don't judge yourself. Remember, there are no mistakes--only new material. If judgment gremlins creep into your mind as you write, encourage them to sit on the patio or invite them to play on the freeway. They have no business being in the same room where you are journaling. I do journal, but often think I have nothing to write about. What should we write about when we are uninspired? One way to start is to look around the room for a sensory image, the dim glow from a lamp with a yellow shade, the flickering of a silent television in a darkened room, the sounds of cicadas on a summer evening, or the aroma of a vanilla candle. Start by describing the sensory image and see where the writing takes you. If you don't want to write, try finishing the sentence out loud, but turn on a tape recorder first. That way, you'll have a record of your thoughts. Everyone has great stories to tell, but you are not limited to stories. Make a list. Write a letter. Draw a picture. Write a poem. Who will record your experiences from your point of view if you do not? In addition to publicizing You Want Me to Do WHAT? I am working on the next issue of Writer Advice, www.writeradvice.com, running an e-mail workshop for journalers, doing a little editing, writing about my post-caregiving life in personal essays, and writing the stories of my pre-caregiving days when I was a drama teacher and director in high school and college. It's great to be busy. Thanks Lynn for doing this interview and sharing with my readers. I wish you the best of luck with your wonderful book! What a great idea! As a sometimes caregiver to my husband I really appreciate this. I'm so glad you like this idea. Caring for your husband can be a challenge and a joy, and at certain moments it can be both simultaneously. If you want to use one of the sentence starts in the article, I'd love to read what you write. I should have done this when I was caring for my mom for a year when she was dying. I think it would help me to reflect more on the good moments with her, instead of thinking back how sad and hard it was to take care of someone who couldn't even remember the simpliest of things for longer than about three minutes. I do have one good memory though, and I focus on that alot. She heard a sound on the PBS station being sung by an Irish Tenor. After he was done singing she had tears in her eyes and said "Please sing it again." Music somehow got through to my mom's brain, when other things wouldn't. Since she loved the song so much, and I had never heard it before, I asked my younger sister to find the music and words. We had that song sung at her Funeral by a man who had a wonderful full bodied Tenor Voice. I think she would have wanted it that way. I have a friend dealing with an elderly father out of state, one dealing with ailing MS issues, and two people dealing with cancer issues. This sounds like a good book to help them out. It will help them help themselves also. Thanks. What a great story about your mom and her love of music. I love the details, and I think you are exactly right. I'm sure your mom approves. Some of the best journaling is done by former caregivers. I think you have a lot to say, and I hope you'll keep writing. I am sorry you have so many friends dealing with physical problems. Like me, you must be "of a certain age." I agree that the book would be a help. Great holiday present, if you are so inclined. Thanks for sharing here. Thanks so much, V. Do you journal? Excellent, Bobbi Janay. BTW, I love that photo. Have you tried journaling?